Macclesfield have sacked manager Brian Horton after a run of results that have left the club bottom of League Two. The Silkmen are currently seven points adrift of second-from-bottom Boston United, having failed to earn a single victory in 12 matches this season. A club statement read: "Brian Horton has been relieved of his duties following a poor run of results. "We'd like to put on record our thanks to him for his efforts and commitment during his two-and-half years here." 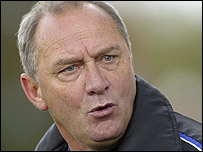 Former Manchester City boss Horton took over at Moss Rose in April, 2004 - his seventh club in management. He helped the club survive relegation that year and then narrowly missed out on leading the Silkmen to promotion the following year, losing in the play-offs. But he was unable to build on that success and a disappointing season last term preceded this campaign's struggles. Macclesfield have confirmed that "further announcements will be made regarding the management of team affairs in the near future".